The College Fed Challenge is a competition designed to bring real-world economics into the classroom. Each university selects a team from among its students. The teams play the role of monetary policymakers. Judges from the Federal Reserve System evaluate the teams both on their analysis of economic conditions and their recommendations of the best monetary-policy response. The teams have a prepared 15-minute presentation, and then are also grilled by the judges with questions designed to test the depth of their understanding. 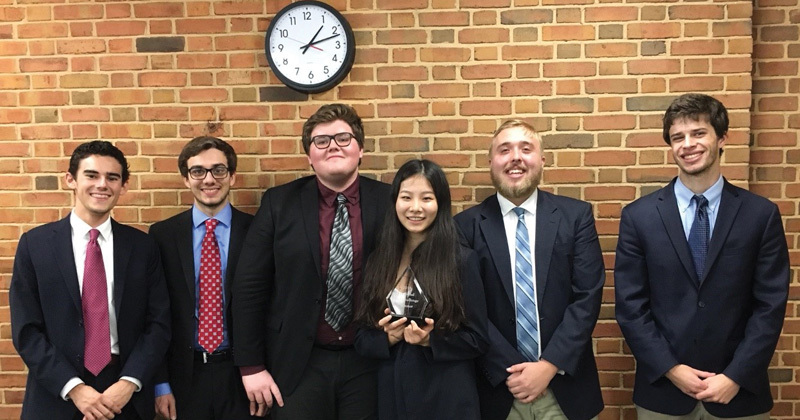 This year’s traveling team includes Zac Gonzalez, Zach Edwards, Tyler Gwinn, Zhizhuo (Ellen) Wang, John Suggs, and Kent Andrews (as pictured above from left to right, after their triumph in the sectional at Wake Forest University this October). They are the performing edge of a team of 20 students who spend the spring and early autumn months working together to prepare for these competitions. The first-round competition this year was on 20 October. By early October the team was meeting several times a week. They had long Saturday sessions in Gardner Hall with their faculty advisor, Professor Michael Aguilar, quizzing them on practice questions while they refined the content and delivery of their responses. The team did wonderfully in the sectional at Wake Forest University. They were up against stiff competition from throughout North Carolina. Two former UNC graduate students—Danny Soques of UNC-Wilmington and Andrew Graczyk of Wake Forest University—were mentoring those schools’ Fed Challenge teams. It became an intra-family battle, but our students came out on top. 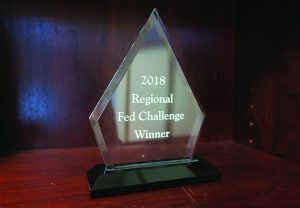 The second round of competition was at the Federal Reserve Bank of Richmond on 16 November. The team did a great job, but the Virginia Commonwealth University team was victorious. The Fed Challenge team came back to Chapel Hill and immediately started planning for the next season. Professor Aguilar recognizes the learning boost that comes from the Fed Challenge. As he puts it, “Experiential education is a powerful pedagogical force. Add an element of competition, and you have a potent learning tool.” Our students revel in the chance to apply what they have learned to the real world. During the sectional competition at Wake Forest University, the judges provided the team a theoretical scenario describing the state of the US economy one year from that day. The team’s goal was to craft appropriate monetary policy as if they were standing in that environment. According to Professor Aguilar, “Our team handled this wonderfully. So much so, that I personally think the judges ran out of questions. After a long pause one judge asked ‘How would you explain that plan to the President of the United States?’. Everyone, including the judges, laughed.” The team, as usual, gave a sensible, professional, polished, response.